Asthma is a serious and potentially debilitating respiratory autoimmune disorder. People with asthma suffer from constriction of the bronchi in their lungs, reducing their ability to breathe. Although in many cases asthma can be effectively managed with medication, sometimes medication is not enough. Without prompt medical treatment, an asthma attack can lead to brain damage or death from asphyxiation. The Social Security Administration’s disability program is designed to provide financial help for people with serious conditions that prevent them from working. If a patient suffers attacks that require a physician’s intervention at least 6 times a year, despite prescribed treatment, they are considered disabled under the SSA’s rules and eligible for disability benefits. Even for people with conditions that automatically make them eligible, the process of applying for disability can be a long and difficult one for patients trying to apply alone. There are income restrictions and required medical documents. Asthmatics must undergo 12 months of supervision to measure the frequency of their attacks. If you suffer from severe, chronic asthma—either frequent attacks or chronic asthmatic bronchitis—you may be eligible for disability benefits. 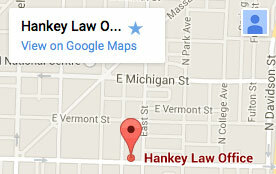 Although applying for disability is difficult, the compassionate Indianapolis social security lawyers of the Hankey Law Office can help you put together a claim to help you fight for the compensation you need. To discuss your case with a lawyer, contact us today at (800) 520-3633.